Adhesives There are 2 products. Bob Smith Slow-Cure epoxy 30 min. 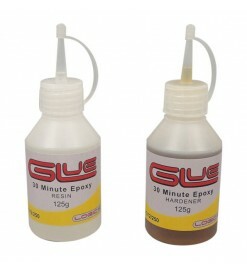 Two-components epoxy glue, with 30 minutes curing time. High-strength glue to bond wood, cardboard, plastic, metals and other materials. Epoxy glue for assembling large kits and anytime a hstrong bond is needed. Mix ratio 50/50. Working time 30 min.